It’s time again for another ESAD Blog Hop. ESAD stands for “Extra Special Australasian Demonstrators” and it is an on-line group just for Australian and New Zealand Stampin’ Up! demonstrators. Now the blog hop started at Chloe Evans and you may be joining in from across the sea with the talented Narelle Hoggard, but if you are joining in here, no worries, just keeping on hopping around each blog until you get back here. Now for my project. I’ve joined in a couple of the U-Stamp with Dawn Big Shot classes and received lots of templates for great projects but I’ve rarely used them. (Bad, I know!!) 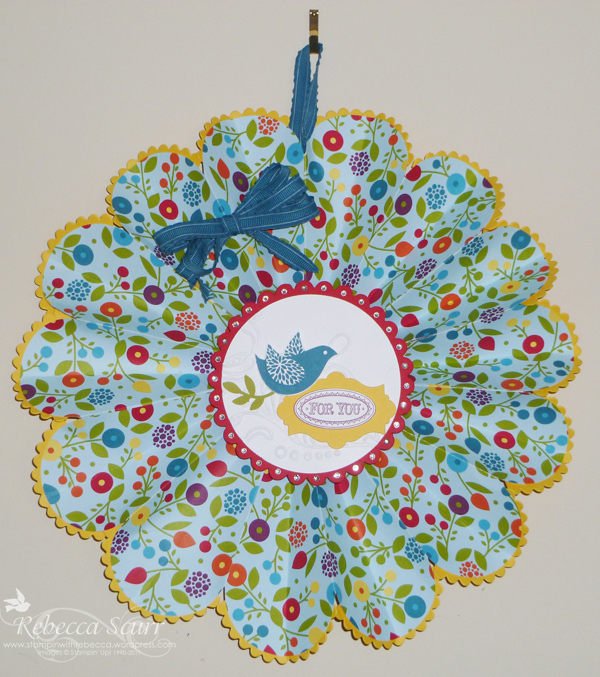 I wanted to make something a little different this time, so I had a look through my templates and decided upon the Petal Cone Accordion Wreath which was designed by Betty Traciak. Here’s a close up of the centre. 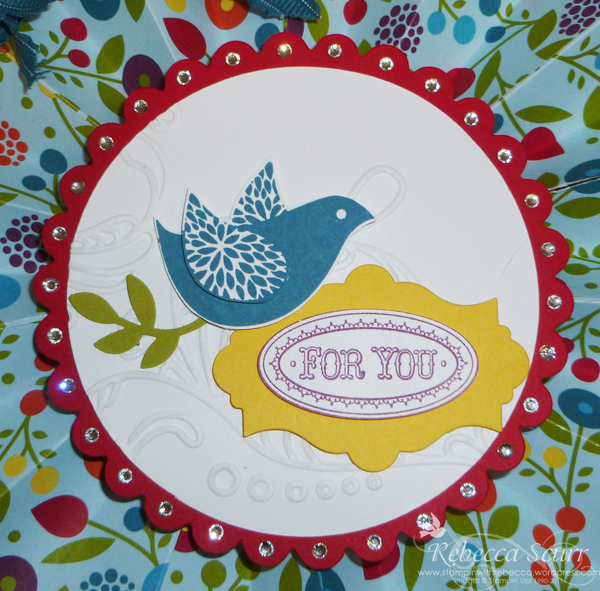 I’ve used the Scallop circle die and I’ve place rhinestones in each scallop (did you know that there are 30!). I’ve used one of my favourite embossing folders, Elegant Lines. The birdie is sitting on a branch from the Bird builder punch. I also cut out the wing of the bird and popped it out with a dimensional. I had stamped the whole image from the Layered Labels stamp set in Rich Razzleberry but it need a bit of Daffodil Delight to brighten it up. I used the Island Indigo Ruffled Ribbon for the bow. Accessories: Big Shot, Petal Cone die, Scallop circle die, Elegant Lines embossing folder, Apothecary Accents Framelits, bird builder punch, rhinestones, Island Indigo ruffled ribbon. Now your next stop on the hop is with the very talented Delys Cram from New Zealand. Just click on her name and enjoy your trip across the sea! Here’s a list of all the blogs in the hop, in case you get side tracked. I hope you enjoy all the wonderful creations from these talented ladies. Just click on their name and it will take you to their page. WOW, I’ve never seen this project before. Love it. Awesome, happy DSP! That is so pretty, and so different, I love it! wow love your wreath. Great idea and love the colours. Wow Rebecca, this is gorgeous. So sunny and bright. Beautiful!! 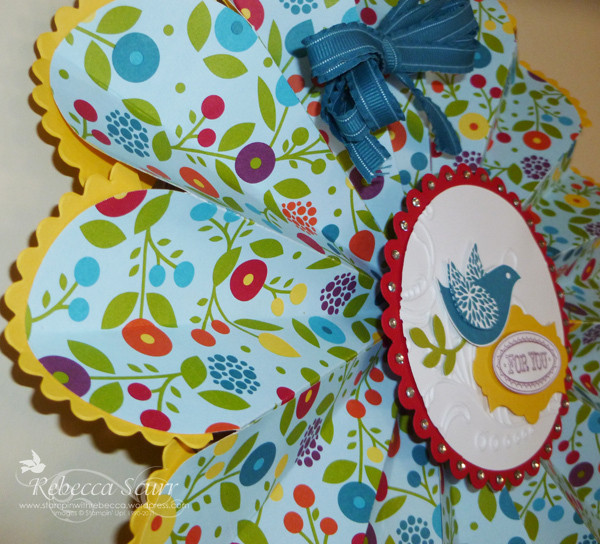 Rebecca this is such a great project – I love the bright colours you have chosen. Love this Rebecca – nice and bright and cheery. Love how you have thought outside of the box with the petal cone die.